Provide comfort for the family of Anne DiMella with a meaningful gesture of sympathy. It is with saddened hearts that we announce the passing of Anne DiMella (Platek) at Westfield Care and Rehab Center on Friday, January 25th. She passed away quietly and peacefully with family present, exactly how she wanted. The first of four children, Anne was born on September 5, 1938 and grew up in New Britain, Connecticut. Anne, a rebellious youth, met George DiMella Sr. on a blind date on New Year’s Eve and became the most devoted wife and loving mother to five rambunctious children. Anne was a quiet, reserved adult but those lucky enough to get close to her were rewarded with her wry wit and sharp intellect. She was always able to answer every question on Jeopardy, every single night. 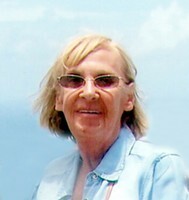 In her later years she enjoyed traveling with her beloved husband and extended family and friends, as she was frequently off on a cruise or trip somewhere. She loved spending time at the casino and was known to partake in one glass of wine from time to time. She adored her grandchildren and reveled in stories of their various academic, creative, and athletic exploits. Anne was predeceased by her loving husband of 55 years, her younger brothers Edward and Steven Platek, and her parents John Platek Sr. and Helen (Kristopik). She is survived by her five children; Jeffrey DiMella of Meriden, William DiMella (Silvia) of Meriden, Christopher DiMella (Jacqueline) of Brewster, New York, George DiMella Jr. of Jacksonville, Florida, and Jennifer Jarvis (Justin) of Southbridge, Massachusetts. Anne was deeply loved and surrounded by her grandchildren; Taylor, Stephanie, Trina, Drew, Alina, Brenna, Braedon, and Amelie and great-grandchild Jennifer. Anne is also survived by her sibling John Platek Jr. (Cheryl) of Old Orchard Beach, Maine. A memorial gathering will be held on Friday, February 1, 2019 from 5 to 7 P.M. at the John J. Ferry and Sons Funeral Home, 88 East Main Street, Meriden, Connecticut. Burial will be at the convenience of the family. In lieu of flowers, please donate to charity of your choice. For online condolences, please visit jferryfh.com. To plant a memorial tree in honor of Anne DiMella, please visit our Heartfelt Sympathies Store.